In 2012, as work on Mass Effect 3 came to a close, a small group of top BioWare employees huddled to talk about the next entry in their epic sci-fi franchise. Their goal, they decided, was to make a game about exploration—one that would dig into the untapped potential of the first three games. Instead of visiting just a few planets, they said, what if you could explore hundreds? Five years later, it’s hard to find anyone who’s ecstatic with the results. Mass Effect: Andromeda, released in March 2017, disappointed even the biggest fans of BioWare’s longrunning series. Although some people enjoyed the game, it was widely pilloried, with critics slamming its uneven writing, frequent bugs, and meme-worthy animations (our own review was just lukewarm). The PS4 version of Andromeda has a 70% on Metacritic, lower than any BioWare game to date, including the ill-advised Sonic Chronicles. Almost immediately, fans asked how this happened. Why was Andromeda so much worse than its predecessors? How could the revered RPG studio release such an underwhelming game? And, even if the problems were a little exaggerated by the internet’s strange passion for hating BioWare, how could Andromeda ship with so many animation issues? I’ve spent the past three months investigating the answers to those questions. From conversations with nearly a dozen people who worked on Mass Effect: Andromeda, all of whom spoke under condition of anonymity because they weren’t authorized to talk about the game, a consistent picture has emerged. The development of Andromeda was turbulent and troubled, marred by a director change, multiple major re-scopes, an understaffed animation team, technological challenges, communication issues, office politics, a compressed timeline, and brutal crunch. Mass Effect: Andromeda was in development for five years, but by most accounts, BioWare built the bulk of the game in less than 18 months. This is the story of what happened. The first Mass Effect, released in 2007, was critically acclaimed but hardly perfect. Fans and critics praised its character design and storytelling, yet many people hated the Mako, a clunky land rover that the player could drive to traverse planets. So BioWare doubled down on what worked—the story, the dialogue, the combat—and ditched the exploration, axing the Mako for subsequent games in the trilogy, Mass Effect 2 (2010) and Mass Effect 3 (2012). Outside of that whole ending kerfuffle, both sequels were widely loved. For the fourth Mass Effect, BioWare wanted a fresh start. Rather than develop a Mass Effect 4 at the studio’s main headquarters in Edmonton, which had made the first three games, BioWare decided to put its Montreal studio in charge. Meanwhile, BioWare Montreal, which was founded in 2009 to develop downloadable content like Mass Effect 3’s Omega expansion, would lead production on the next Mass Effect. By 2013, Mass Effect: Andromeda had entered pre-production, the phase of development in which the team behind a game figures out the scope, workflow, and outline of what needs to get done. BioWare also hired a new director, Gérard Lehiany, who had previously directed the Spiderman games at the Activision-owned studio Beenox. Lehiany, who wanted to lead the game’s narrative team, came up with several ambitious ideas. One of those ideas became the core concept of Andromeda: during the events of the Mass Effect trilogy, the galaxy’s ruling Citadel council had sent a group of colonists out to a new galaxy to find habitable planets, as a contingency plan in case Commander Shepard and crew couldn’t thwart the devastating Reaper attack. You, the player, would take on the role of Pathfinder, leading the quest to rebuild civilization in the Andromeda galaxy. The Mass Effect: Andromeda team knew they were going to run into major technical barriers with or without procedural generation. Over the past few years, one of BioWare’s biggest obstacles has also become one of EA’s favorite buzzwords: Frostbite, a video game engine. An engine is a collection of software that can be reused and recycled to make games, often consisting of common features: a physics system, a graphics renderer, a save system, and so on. In the video game industry, Frostbite is known as one of the most powerful engines out there—and one of the hardest to use. Developed by the EA-owned studio DICE, Frostbite is capable of rendering gorgeous graphics and visual effects, but when BioWare first started using it, in 2011, it had never been used to make role-playing games. DICE made first-person shooters like Battlefield, and the Frostbite engine was designed solely to develop those games. When BioWare first got its hands on Frostbite, the engine wasn’t capable of performing the basic functions you’d expect from a role-playing game, like managing party members or keeping track of a player’s inventory. BioWare’s coders had to build almost everything from scratch. “Whenever you’re trying to do something that fits the engine—vehicles, for example—Frostbite handles that extremely well,” the developer said. “But when you’re building something that the engine is not made for, this is where it becomes difficult.” Designing the large maps of Andromeda’s planets became a struggle on Frostbite, where the maximum size of a map was initially 100 by 100 kilometers. The Andromeda team needed their maps to be way bigger than that. Other struggles included the streaming system, the save system, and various action-RPG mechanics that Andromeda needed in order to work. Pre-production on Mass Effect: Andromeda was a tale of two cities. Several people from the team described 2013 as one of the best years of their professional lives and 2014 as one of the worst. Whereas 2013 was full of possibilities for the developers of Andromeda, 2014 was full of politics. Conflicts emerged between BioWare staffers at the company’s two main studios, in Edmonton and Montreal. Developers in Edmonton said they thought the game was floundering in pre-production and didn’t have a strong enough vision, while developers in Montreal thought that Edmonton was trying to sabotage them, taking ideas and staff from Montreal for its own projects, Dragon Age: Inquisition and Dylan. By the end of 2014 at least a dozen people had left BioWare Montreal for other studios, and it wasn’t clear to the remaining staff whether those positions would be replaced. The animation team in particular was understaffed, sources said, and when people left, their positions sometimes weren’t refilled. In August of 2014, Casey Hudson left BioWare. Not long afterwards, Gérard Lehiany also departed, and BioWare brought in longtime Mass Effect writer Mac Walters, who was based in Edmonton, to serve as Andromeda’s new creative director. Different people point to different reasons for these personnel shifts, but the directorial change had a massive impact on production of the game, as Lehiany had been leading the story team up until that point. When Walters took over, he brought a new vision to the game. On top of that, sources said, some teams didn’t have the proper tools and pipelines to create the parts of the game they needed to create. “I think it’s universal for the game, that while they said they were done with pre-production and moving into production, a lot of teams really didn’t have what they needed to do their jobs,” said one developer. By the end of 2015, Mass Effect: Andromeda’s leads realized that the procedural system wasn’t working out. Flying through space and landing on randomly generated planets still seemed like a cool concept—and by then, many people at BioWare were looking with great interest at No Man’s Sky—but they couldn’t make it work. So they decided to rescope. Many of the gameplay mechanics—the combat, the multiplayer, the driving—were on time and proceeding smoothly. Those weren’t touched by the rescope. But the content—the story, the levels, the cinematics—was way behind schedule after Andromeda’s messy pre-production cycle. That was a problem. In some ways, BioWare employees say, this initiative is great. Collaborating across studios can lead to some solid creative mind-melding, and it’s far easier to recruit in Montreal and Austin than it is in Edmonton, a city best known for its obscene temperatures and giant shopping mall. It wasn’t just the writing. Almost every Andromeda developer who spoke to me for this story said the bulk of the game was developed during that final stretch, from the end of 2015 to March 2017. Most of Mass Effect: Andromeda was made in just a year and a half, by those accounts. “It really wasn’t until Mac Walters came on board—and that was very much a reaction to the state of the critical path—he was really brought on board to give it direction and get it into shape,” said one person who worked on the game. “Before that it was quite rudderless.” Some at Montreal saw the directorial shift as Edmonton trying to take over their game, while some at Edmonton saw it as them needing to come in and rescue it. One developer close to the project disputed the characterization that most of the game was developed in the final 18 months, saying that most of the ideas in the final game closely resembled those early visions. The root causes of this regression could be tough to identify. Sometimes they were as complicated as an engineer updating a core system; other times, they were as simple as a character modeler changing the look of an NPC. It was draining, developers said, because they felt like they were constantly redoing parts of the game that they thought they’d already finished. “The types of problems that arise from the entire project coming together in the last year and a half really compound at the end,” said one developer. This video, comparing leaked footage of Andromeda from April 2016 to a final build of the game, is one example of what this regression could have looked like. The downgrade in quality could have been caused by any number of factors ranging from the lighting changing to the animations taking up too much memory, a source said, but those were the sort of problems they faced. While we’ve seen other games get graphical downgrades from their initial trailers to final products (Watch Dogs, The Witcher 3), it was unusual to feel like they were regressing this much so late in development, that source said. The “downstream” teams—effects, cinematics, audio—were hit the hardest during the final months of development. “Because the entire project was behind schedule and teams were wrapping up later than ideally they should have, that just compounded even more on the downstream teams,” said one person who worked on the game. 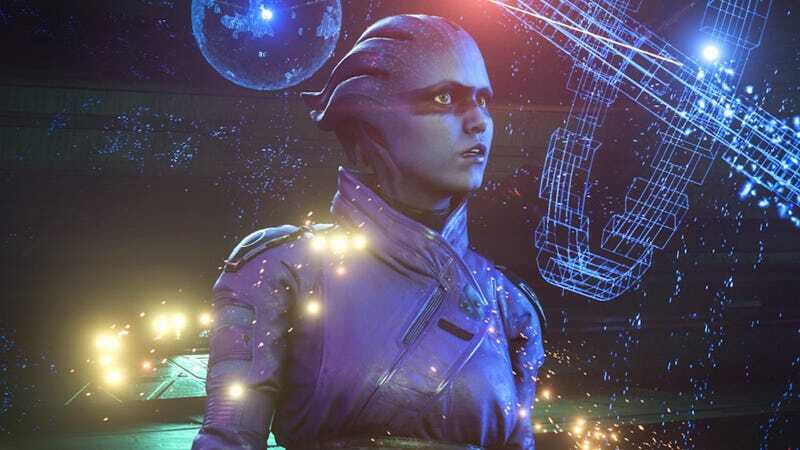 There was a lingering feeling of hopelessness during those final months, developers said, and some who worked on Mass Effect: Andromeda say it was the most challenging project they’d ever faced. In game development, it’s common for the directors of a team to put together lists of the biggest risks or challenges they think they’ll face. On Mass Effect: Andromeda, the leads flagged several of these major risks. There was the story. There were the procedurally generated planets. And then there was the animation. Mass Effect: Andromeda has been criticized for several things, but the images that will be remembered most are the memes—GIFs of gorilla walks, silly faces, and the main character’s eyes darting from side to side like she’s watching a high-speed game of tennis. It’s been subject to a great deal of speculation over the past few months, with theories ranging from naive (EA bought BioWare and now they’re all lazy) to deranged (BioWare made all the characters ugly because they’re SJWs). In reality, as is often the case in game development, there is no single explanation. Mass Effect: Andromeda’s animation issues were, to put it simply, the result of a game with a turbulent development cycle. During pre-production in 2013 and 2014, as the engineers and technical animators tried to figure out how they would handle Andromeda’s animation, they ran into several obstacles. They’d hired an Egyptian company called Snappers that could create beautiful facial animations, but there were lingering questions about how to implement those animations into the engine and how to scale across the whole game. And there were constant arguments over which technology to use. Some on the team wanted to use a program called FaceWare, used by EA’s Capture Labs studio in Vancouver, but others argued that it wasn’t good enough. 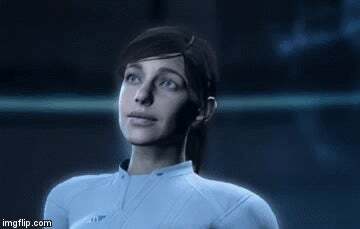 Most of the lipsync in Mass Effect: Andromeda—like other Mass Effect games—was handled by a common piece of software called FaceFX that can interpret sounds and automatically move characters’ lips accordingly. One source pointed to this Twitter thread by former BioWare animator Jonathan Cooper (who did not work on Andromeda but did work on previous Mass Effect games) as the most accurate description of the process. “Because time denotes not every scene is equally possible, dialogues are separated into tiered quality levels based on importance/likelihood,” Cooper wrote. “The lowest quality scenes may not even be touched by hand. To cover this, an algorithm is used to generate a baseline quality sequence.” Another big factor, sources said, is that Andromeda lets you create your own character. 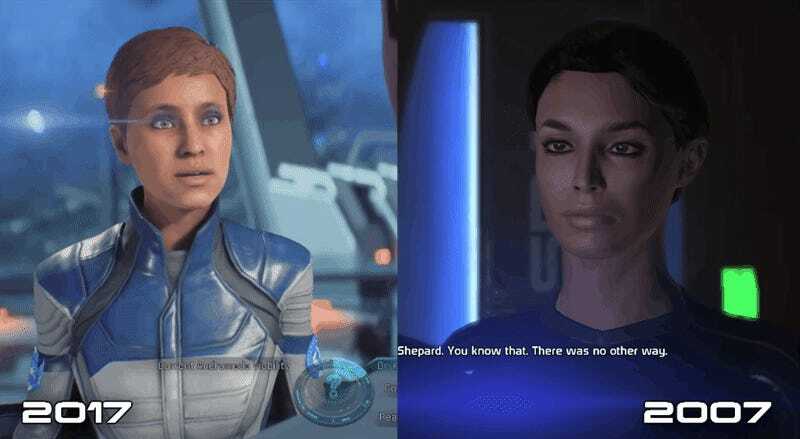 Fans have compared Andromeda’s facial animations to the likes of The Witcher 3 and Horizon: Zero Dawn, but those games have predefined main characters, which makes it far easier for animators to predict exactly what their faces will look like during any given cut-scene or line of dialogue. The animation issues we saw in Mass Effect: Andromeda were the result of all of these factors, said people who worked on the game. Not just one. Not long before Mass Effect: Andromeda launched, BioWare sent early builds of the game to mock reviewers, as nearly every AAA game developer does in the months before their game comes out. A mock reviewer will typically offer a private, early assessment of a game, a report on its strengths and weaknesses, and a predicted Metacritic range. Companies frequently make major strategic decisions based on Metacritic scores, so it’s that number that gets the most attention. When the mock reviews came in for Mass Effect: Andromeda, BioWare’s leads were relieved—the Metacritic was expected to be in the low-to-mid-80s, according to two sources. Although Andromeda’s developers knew the game wasn’t perfect, they were fine with a score like that. If they hit somewhere between 80 and 85, they could use what they’d built for Andromeda to make the sequel way better, much like Casey Hudson and his team had done from Mass Effect 1 to Mass Effect 2. Then the GIFs started. EA put Mass Effect: Andromeda out early for EA Access users on March 16, five days before the game came out, which led to a weekend full of memes, anger, and nasty harassment as players shared images and gifs of the game’s many glitches. Combine that with the fact that three of the other games released in March 2017 turned out to be all-time classics (Zelda: Breath of the Wild, Horizon: Zero Dawn, and Nier: Automata) and you’ve got a recipe for low review scores. When the Metacritic score finally settled, Mass Effect: Andromeda wound up with a 70 (on PS4, where it has the most reviews), far lower than those who had seen the mock reviews expected. The results were catastrophic for BioWare Montreal. Even as the team kept plugging away on patches to fix bugs, add more romance options, and polish animations, their management informed the Montreal studio that it would be scaled down and that Mass Effect was going to be shelved for a while. All hopes for an Andromeda sequel were immediately dashed. EA moved many of BioWare Montreal’s developers to EA Motive, putting others on support roles for BioWare’s other games, including Dylan and the next Dragon Age (internally referred to as Dragon Age 4). It’s a tragic ending for a studio that set out to do something ambitious but couldn’t quite deliver. “At a very high level, even though the game was in development for five years,” said one person who worked on the game, “Mass Effect: Andromeda was just trying to do too much with too few resources.” BioWare aimed for the stars—hundreds and hundreds of procedurally generated stars—but just couldn’t get there. Like Ryder setting off for Andromeda, the studio’s journey ended in nothing but disappointment.